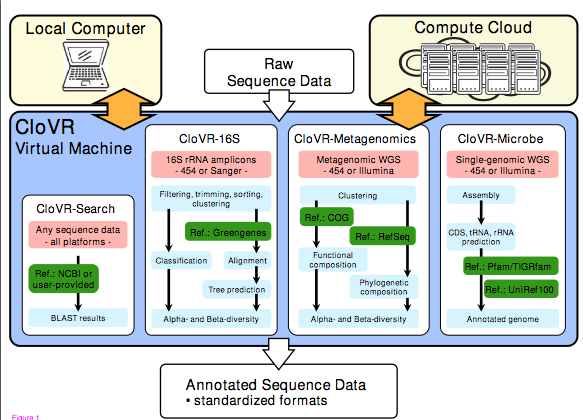 CloVR is brought to us by Florian Fricke and Owen White and Sam Angiuoli and others from the University of Maryland (full disclosure – many of the authors are ex-colleagues of mine from TIGR). Not only is Clovr available openly and freely but they even have a Clovr blog: http://clovr.org/category/blog/ … though it does not seem to be heavily used. Kudos to this team for producing and releasing this software for others to use. And kudos to NSF, USDA and NIH for funding its development — I have a feeling many people will use it. Author Jonathan EisenPosted on September 3, 2011 April 10, 2017 Categories Misc.Tags Bioinformatics, cloud computating, CloVR, Genomics, Misc. I am curious if you know how to estimate how much computation is needed for metagenomic analyses? I am considering Amazon Web Services (AWS) as they offer a free trial of 750 hours CPU time a month. Is that a lot or not much for 8-10 GB of MiSeq whole-genome sequence data? CloVR almost never works on anything but sample files and even those don't always work.